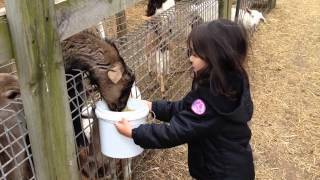 Golden Ridge Animal Farm is a family friendly farm you can visit in the hills district of Sydney. Join in the tour to get up close and friendly with lots of baby animals. Bottle feed the baby lambs and kid goats. Milk the cows, Hold baby chicks, ducklings and rabbits. Go for a walk to feed and pat all the friendly farm animals. Stay for lunch and have a pony ride. All within a 40 minute drive from the harbour bridge. Open everyday of the year (except Christmas day). Booking essential. Tour starts 10.30am weekdays and 11am weekends and public holidays.